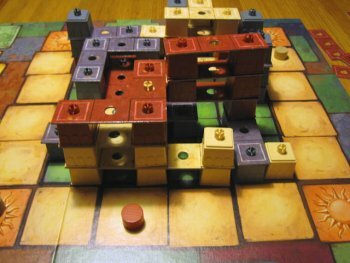 At the beginning the game board only displays a plain building site divided into a square grid. In the game, the players try to construct multi-storey buildings onto this site. Each player chooses his or her own colour and gets 24 building blocks representing columns and 17 platforms constituting the storeys. All of these platforms are layed out differently. Some are cross-shaped, some are L-shaped and still others only constitute a line. It is these geometric elements which reminded me strongly of the classic computer game Tetris. And indeed, some of the mechanisms seem to be the same, too. During the game, players move their game tiles around the construction site. Movements are determined by the die, but players may opt to expand the range of movement by paying points from their bonus tracks. In case a player completes his or her turn in a corner, the bonus points are replenished. However, if a player stops next to the construction site he or she has to put one of his or her building blocks onto the adjacent two rows or lines of the building site. But until now, only columns are placed onto the site. To construct the buildings, players must also put their platforms in place. For this, each platform bears marks indicating the spaces where the platform must be founded on the player's own columns. Only if this requirement is met, a platform may be placed onto the site. As construction activities progress, the site becomes more and more crowded with columns and platforms and consequently free spaces are increasingly scarce - not least because players may only use their own building columns and none of the opponents' as foundations for the platforms. We know this phenomenon from real life large cities where people build blocks of flats and skyscrapers, and the same can be found in Casa Grande. From the moment when the first platform is placed onto the board, players may put their building columns on top of these platforms. Thus, a second, third or fourth storey is erected, with the overall height of the building only being limited by the available number of building material. In contrast to the usage of columns, players may also make use of their opponents' platforms, but for this the opponent receives points on the bonus track according to the height of the respective platform as compensation. Well, these are the rules, but, one might want to ask, what is the aim of the game? Players take on the roles of builders, earning money from the construction of buildings. Each time a player has succeeded in placing a platform, he or she will receive a payment. The amount of payment is determined by multiplying the height of the platform with the space covered by the building. For example: a platform on the second floor which covers four squares earns the player eight Lira, the currency of Casa Grande. 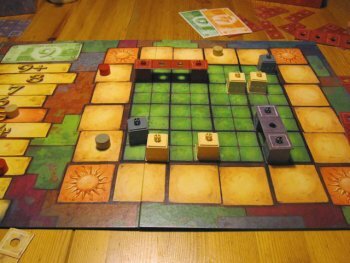 The game is over after the round in which the first player succeeds in placing his or her last building column onto the game board. One last word has to be said about the bonus track. The points on this track can not only be used for expanding the range of movement, if the ninth bonus point is reached they can also be exchanged for nine Lira. Sometimes the beginning of a game proves a little confusing since some of the players are not familiar with the available shapes of platforms. Thus, during their first few turns, players spend quite a lot of time with rummaging through their stock of platforms. But after a while the game progresses smoothly, if not too many floors are under construction. At that moment, the tactical elements of the game become more and more important and players take their time in order to make the right decisions. Nevertheless, the game in summary still proves to be rather fast paced. With the beginning of the construction of the third floor, however, players have to pay considerably more attention in order not to lose track of the game and to make sure in particular that none of the players places his or her building columns onto the incorrect row or line. Moreover, as the buildings reach to the sky, it becomes rather difficult to detect the remaining free paces on the lower levels. That the game material easily slips out of position, if careless people touch the columns a little bit too impetuous is no help either. Especially with younger children the placement of the building blocks on top of each other might prove a rather wobbly experience. Here RAVENSBURGER should have invested a little more for better playing materials. However, these minor flaws did not compromise my pleasure in playing the game. 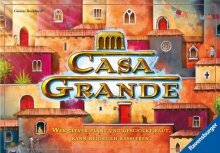 Casa Grande presents some well-known game mechanisms clad in new 'clothes', the rules are very short and the whole game advances very quickly and entertainingly. Günter Burkhardt has adopted his going-round-the-board-mechanism, known from Herr der Ziegen and Kupferkessel, to a new game experience and a nice family game.